I’m here to bring you another product review. I want to start off by saying that I think all of these products are priced well and can easily be found online or in stores at CVS Pharmacy or Ulta. It has been a few months since I’ve tried out some new products that aren’t for your hair, so I was really excited about these, especially because the entire brand was entirely new to me. My initial impression is that the brand and the products are very innovative and affordable. When I first received the items I was intrigued by the different ingredients used, and the variety of products for individual needs (minimize pores, retouch finish, plumping). On the other hand, I like to keep a lot of my face products “natural” or at least with ingredients I am familiar with and I can’t exactly say that about these products. It’s rare that I get a new product and immediately fall in love, but y’all this is it! The product is advertised to address wrinkles, and dark circles and while I don’t have wrinkles, I feel like my dark circles are very apparent without make-up and it is often the only reason I decide to put make-up on. I have only been using the product once or twice a day for one week and the difference is incredibly evident. BUY BUY BUY! I consistently buy another brand of make -up wipes, despite the fact that they aren’t my favorite. They leave a oily residue and I always feel like I need to rinse my face afterwards. These Nip & Fab wipes don’t leave a residue, and they don’t make you face feel sticky or tight. If you were a lot of make-up I could see how you would dislike these because the pads are small circles and you may need to use more than one. Lastly, it smells like sunscreen which I really don’t like. When I first received this product I was a little confused as to what it was…”a plumping serum.” Is it a moisturizer? Should I use it at night? What does plumping mean? Online the product description says that the Dragon Blood “forms protective film on skin to protect against environmental aggressors.” In theory this sounds cool, but I can feel that protective film on my face which isn’t my favorite. And again, the smell is too strong.. In theory this product is pretty cool. It is advertised as “blurring” fine lines and pores to give you a “retouched finish” so in my head it sounds like the perfect product to use on the days that I don’t wear make-up. A little goes a long way, and I like the dropper packaging. I can’t say it makes a huge difference, but I can see the effect. Overall, I can confidently say that I will definitely be buying the eye rolling product again and maybe the face cleansing pads. If the fragrances were changed I would be more apt to buying the Viper Venom Fix Blurring Shot. 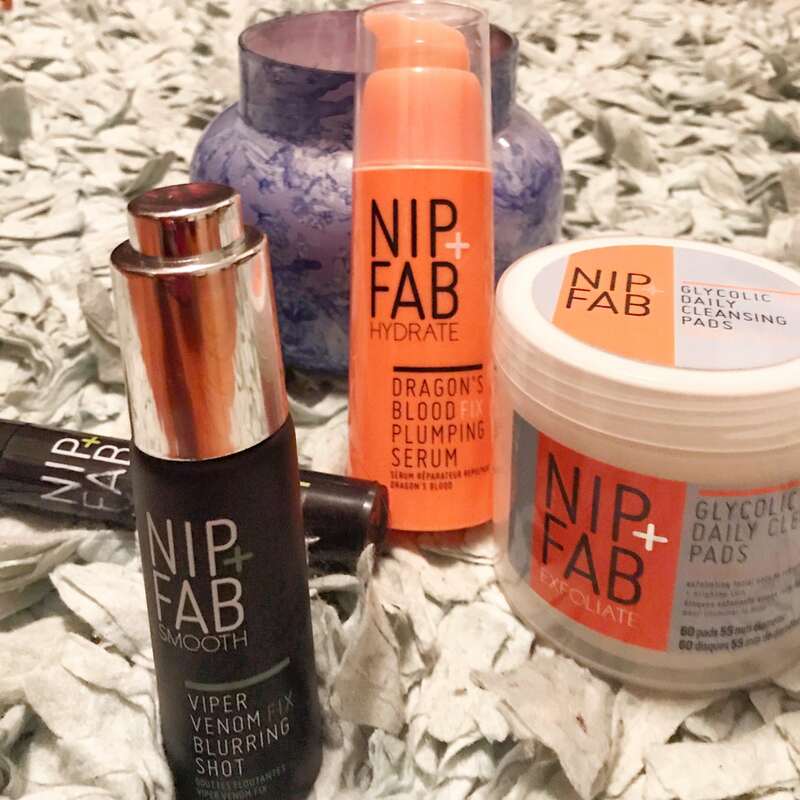 Honestly, this was a really fun package to receive because I had never heard of the company or even a lot of the products, so thank you to Nip & Fab and Collectively!